TechDays 2014: Windows Azure experts on the Windows Azure on stage !! Microsoft asked me to be one of the Windows Azure experts on the Windows Azure stage during the TechDays 2014 Paris, 18000 visitors. How to say no to such offer ?!! Based on true massive fixed-price Azure projects, my role is to present how to easy it is to enforce DevOps and Dev-Tests thanks to Windows Azure. 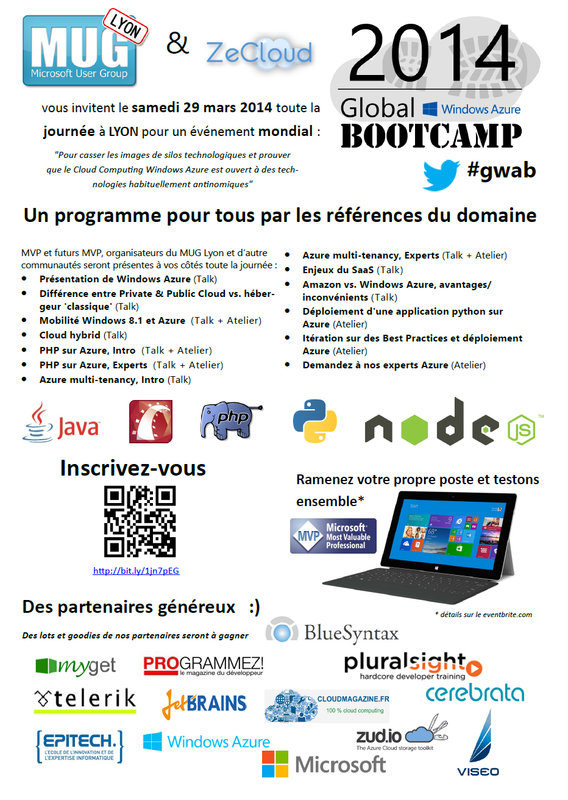 I will also take to opportunity to represent the MUG-Lyon (Microsoft User Group) : as the lead organizer of the Global Windows Azure Bootcamp in Lyon for 2014 event. Its an unusually large bootcamp, since it targets 100 to 200 people, with 3 tracks in parallel and over 9 Azure experts from around France / Switzerland, to provide talks, live coding and demos. Plenty of technologies to prove that Azure Cloud is respectful of your preferred programming language and environment.